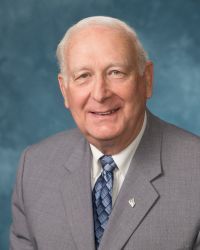 Eugene R. Tewalt was elected to the Front Royal Town Council July 1, 2012. He previously served on the Town Council from 2000 - 2004, 2006 - 2008 and as the Mayor of Front Royal from 2008 - 2010. Councilman Tewalt has lived in Front Royal since 1974. He retired from the Town of Front Royal after 25 years of serving as The Director of Public Works/Engineer. He also worked for the Virginia Department Transportation as a Surveyor. He has a degree in Civil Engineering and a Certificate in Highway Engineering. Mr. Tewalt has served on the Virginia Department of Transportation Bridge Task Force Team and has been a member of the Front Royal Rotary Club for 25 years. He and wife are members of the Front Royal Church of Christ. Councilman Tewalt is an abet reader and enjoys playing golf. Councilman Tewalt and his wife Juanita of 50 years, reside at 1032 Wine Street and have two children (Angela and Tim) and three grandsons.